"Ice and water shield is a far superior product compared to basic roofing felt paper." 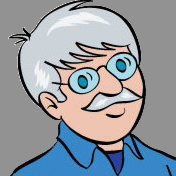 DEAR TIM: Lately I’ve seen roofers install a strange product that looks like traditional felt paper, but it’s not. It has a peel-away backing paper, and this material sticks to the wood sheathing. DEAR CONNIE: Without being there, I’m willing to wager that you saw ice and water shield being installed. It’s an amazing roofing product that was introduced in the 1980’s and has quickly become the gold standard for creating leak-free roofs in all climates. CLICK HERE to get FREE & FAST BIDS from local roofers who can install the BEST ice and water shield. What Makes Ice and Water Shield Different? Ice and water shield is different from felt paper because it's a rubberized membrane that sticks to itself and the wood roof sheathing. It creates a waterproof barrier to standing water if installed correctly. Felt paper does not stick to anything. Roofing ice and water shield may look like traditional felt paper, but it’s vastly different in performance. Ice and water shield is a far superior product compared to basic roofing felt paper. What Does Felt Paper Do? Traditional felt paper does a decent job at stopping most leaks where water gets under shingles, tiles, metal or slate. It does this by using gravity. Gravity allows the water to flow over the tar paper down to the edge of the roof. As long as the water doesn't travel horizontally or along the shaft of a roofing nail, the water will not come in contact with the wood beneath the actual roofing material. How is Felt Paper Installed? Felt paper is installed so each higher row overlaps the row below. In a perfect world water can't get to the wood roof sheathing. How Does Felt Paper Allow Leaks? The overlapping seams of the felt paper can't protect against water that flows BACKWARDS up the roof. But felt paper has problems where it overlaps the sheet below and where the nails penetrate the felt. If water backs up under the roof as happens with ice damming, water can flow up and under the lap joints of felt paper. Are the Nail Holes in Felt Sealed? No. The nail holes through felt paper are not sealed. Where the nails used to attach the roofing materials penetrate felt paper, the actual hole created by the nail is not sealed where it passes through the felt paper. Water can get under the head of the nail and seep down the shaft of the nail where it passes through the felt paper. When this happens, you get leaks into your home. What Ingredients are In Ice and Water Shield? Ice and water shield contains asphalt cement, a special stretchable membrane, and a fancy co-polymer called styrene butadene styrene (SBS). The SBS component makes the product very sticky. The ice and water shield roofing material is made with a rubberized asphalt mixture that solves these problems. Because the product has a very sticky backing, it not only adheres well to the wood roofing sheathing, but it also sticks well to the layer below when you overlap the pieces. Does the Air Temperature Cause Problems During Installation? Yes, the air temperature, as well as direct sunlight, causes problems when installing ice and water shield. When the air temperature is above 60 F and the sun is shining on the ice and water shield product, it's extremely sticky. It acts just like contact cement and whatever the sticky side touches, it will not pull off. You'll have an impossible time pulling it off of anything it touches. Do Nails Seal with Ice and Water Shield? Yes, the nail holes through certain brands of ice and water shield do seal. Be sure you get that guarantee in writing before you purchase a product. When nails penetrate the ice and water shield on the roof, the rubberized nature of the material creates a gasket effect on the shaft of the nail. Leaks simply don’t happen. But not all ice and water shield products offer this!! What Brand Offers the Nail Hole Guarantee? The one I used on my own home has this feature and it really works. 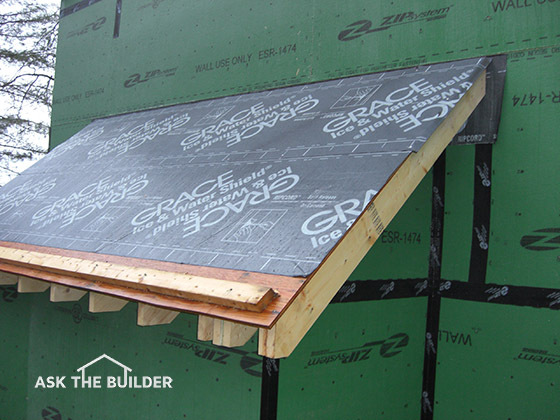 It's Grace Ice and Water Shield®. I covered the ENTIRE roof of my New Hampshire house with Grace Ice and Water Shield. I never have to worry about a roof leak - EVER. CLICK THIS IMAGE NOW TO ORDER SOME AND HAVE IT DELIVERED TO YOUR HOME. Do Other Roofing Products Go Over the Ice and Water Shield? 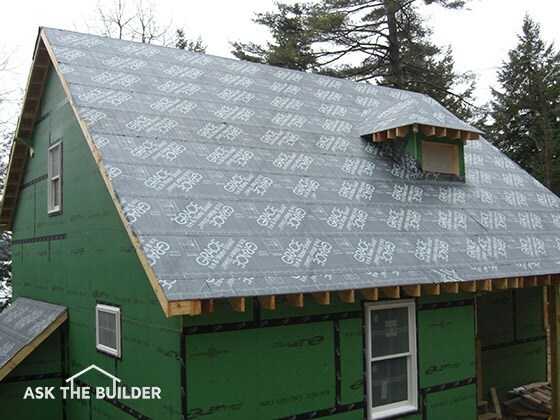 Ice and water shield products are hidden by the finished roofing materials. Not only does ice and water shield installation stop leaks caused by ice dams, but it also stops leaks created by fierce wind-driven rain. Does Ice and Water Shield Protect Against Hurricanes? Yes, ice and water shield will protect your home from leaks caused by hurricanes. If you live in an area that’s frequented by hurricanes or severe thunderstorms that can drive rain sideways, then you need this material. These storms can easily push water under many finished roofing materials. Can I Cover the Entire Roof? You can cover the entire roof with the ice and water shield, but in many instances, it’s applied where leaks frequently happen. The problem is a leak can occur just about anyplace on a roof for any number of reasons. How Far Up a Roof Should it Be Installed to Prevent Ice Dam Leaks? To prevent leaks from ice dams, you may want the product to extend up from the edge of the roof at least 3 feet, but 6 feet is better. I put it over my entire roof because ice dams can form far up a roof. If the roof has a low slope, you absolutely want to extend the barrier product up the roof quite a distance. I would also apply it in any valleys you may have where two roof planes intersect. Do You Use It Around Skylights & Flashings? Ice and water shield is perfect to use around skylights, chimneys, plumbing vents, ventilation caps, or anything that penetrates up through a roof. The roofer laps the material up onto the object and cuts it at corners or curves in a special way to create a leak-proof barrier. Traditional roof flashings then cover this sub-flashing made from the shield product. Can I Apply It Over Existing Shingles? No, you can’t apply it on top of the old shingles. You must apply this product as indicated by the manufacturer. Typically you’ll discover that you must apply the material directly to the wood roof sheathing that’s under the shingles and any old felt paper. Is it Hard to Work With in Hot Weather? Working with ice and water shield can be challenging, especially in warm or hot weather. In these conditions, the back of the material is very sticky. If you start to unroll it and you’re not aligned correctly, you can install it crooked. If you try to straighten it out, you’ll almost always get a wrinkle. Be prepared for a slight learning curve when using the material for the first time. If you’re not astute at how it should be installed, by all means read all the tips from the manufacturer and watch any videos they may have about how to best handle the material. If you’re working on a steep roof, you need to be very careful. Wear all required fall-protection equipment and watch out when stepping on the material if it’s damp, frosty or cold. It can be very slippery. Falling from a roof can really ruin your day. I know, as it’s happened to me on more than one occasion. Ice and water shield is a fantastic membrane that sticks to the raw wood roof sheathing. It sticks to itself and the wood preventing all leaks. Looking to get a low slope sunroom roof re-done. There are 2 skylights. The skylights are leaking and will be replaced. The roof is leaking above the rear windows; we are told the water from the skylight leak is traveling on the downward slope and emerging above these widows. We have been advised to go with a rubber roof. Can 'ice and water shield' be used with a rubber membrane system? Is a rubber roof the best way to go? How about an ice and water shield and a different roof system ( tar and paper?). Please advise. We are in Canada ( cold winters). Your input much appreciated. I am very concerned to do the best thing and solve this leak problem. I need to know if you need to remove ice and dam when reroofing ? Does it need to to be recovered, or can it be just reused? If you are useing the ice and water shield, can you skip (not use) the felt paper all together? Ice and water shield is crap...if you ever have to replace your roof, like after a hail storm. You can't remove the shield, so you have to replace all the wood as well. Insurance won't cover the cost, so the home owner, like me, has to PAY TO HAVE YOUR WHOLE ROOF REPLACED. This article is crap!! Don't buy it!! Uh, what about removing the shingles and then placing a new layer of ice and watershield on the roof? One should only talk! Do you know this persons policy? Can you answer there insurance questions? That would be a NO! You can not! Don't need a Lawyer or a PA! A PA is going to take a percentage of your RCV, but why tell them that fancy Texas adjuster? Dumbass! Take my word for it, I am also a licensed Adjuster in 19 states, read your policy! You want to not go back and forth with your insurance company? Buy the best policy they have with all the endorsements. And always remember the insurance company is putting money in your hand for STORM damage, not Damage! Know the difference. Don't let clowns like this Joe Burnes guy lead you down a dead end path. That would not be correct either. Insurance has to pay for all cost associated with getting your roof back to pre damage condition. That includes roof decking if needs to be replaced as part of the roof. In your case, why would insurance pay for felt or ice and water or valley metal, if they are UNDER the shingles? If an insurance company does not act in good faith, you can take them to small claims court for up to $10,000 in damages. THAT will pay for the roof. Typical insurance adjuster here everybody. First it is THEIR not THERE, if you start using proper grammar you will appear less ignorant. Second being a licensed adjuster is something anyone can do if they are willing to throw all their morals and compassion for their fellow man into the trash and take a two week course. Being an insurance adjuster is on par with being a real estate agent. Third a PA is still better than you, they disclose up front that they will charge a fee, even if they take it from the home owners RCV the home owner will still receive 3-10 times the amount of money you wanted to throw at them to get them out of your hair. Fourth I'm not surprised that you are so lacking of any shred of decency that you resort to cursing at people behind a keyboard, completely disgusting, but I am not surprised. Fifth, you are everything wrong with the insurance industry and they have brainwashed you into thinking that you are actually helping your customers and that you are being moral. If I were you I would seriously consider suicide as an option, then tell your friends to as well. The world would be an exponentially better place to live without scum like you. You are the payday loan, cash for gold scam artist of the insurance industry. You should be completely ashamed of yourself. Diamond Dog, I'm confused. Where you talking about yourself? ...Please don't jump...please. My son just bought a older mobile home and the roof leaks. We just cut the bad shingles out 25' x6' and install the fire and ice over laping everything can he leave it with no shingles on it for a year till he saves to do the whole roof? We liv in Michigan also. When you read the installation instruction for the Fire and Ice product, what did it say about how long you can leave it exposed to sunlight? You did read them, right? am I seeing in a photo on this page, Grace ice and water shield installed over the entire roof deck?? plywood can't breath...... expansion and contraction..... Hello????!!!! do you know what this does to your roof deck? I'm guessing you do not! Hello Joe! Have you read the installation specifications at the Grace website? Have you ever thought about the UNDERSIDE of the wood roof deck and that it can liberate all the water vapor it wants in that direction? And as for expansion and contraction, have you ever thought about providing the minimum spacing between sheets of plywood or OSB to account for this movement? With all due respect, it's comments like yours that make the Internet a very very dangerous place. Anyone like you that can fog a mirror and operate a keyboard and mouse can spout off what *they* think is correct information. From now on, please do your due diligence before writing a comment on any website. Can I apply a rubber roof over ice and water shield? Will the bonding cement adhere? Hello - We are having our roof re-shingled; the roofer plans to use a combination of starter shingles and synthetic underlayment and says that we do not need separate ice and water shield.... Does that sound OK to you? (In MD, Tamko shingles) Thank you! Maryland is not prone to severe snow buildup and ice unless you're in the western part of the state. It might not be a bad idea to put it in on the eaves and any valleys if you FEEL you could get heavy snow. Thanks so much; I appreciate your article and your quick reply. From what my husband says, I think the roofer is thinking like you suggested - not much heavy snow on this side of MD - and that this starter shingle/synthetic underlayment works well for the water aspect (e.g. sideways driving rain). Appreciate your insight.. I am getting a new roof installed. They laid all the fire and ice blocker but had to finish another job so they left for the past week. It has been pouring rain and there are small parts of they plywood that have not been covered at all? One can the shield last a week in the pouring rain and two should they have left some wood exposed that long???? Yes it is fine. Be sure it's CLEAN for perfect adhesion. I am having my entire roof redone. I have two long valleys where the roof on an addition ties into my preexisting roof. I live in Massachusetts where ice damns are common. I'm particularly worried about doing these valleys right. I had one roofer tell me he would put copper flashing down the lengths of the valleys. Several other roofers suggested they would just install 6 feet of ice and water shield. They advised that shingles were supple enough to conform to the valley and make the turn from one roof line to the other. Could you comment on which is the best solution? I really don't want any more ice damn damage! P.S. The quote including flashing was significantly more expensive that the others. You need one of my phone consults. There's a few things we need to go over. The phone consult will save you HUNDREDS of dollars..... Guaranteed. Thank you for helping people with their questions. In a Poconos Pennsylvania location, we have a 14' x 12' lean to shed that needs covered before winter. Contractors just do not come right over and do a small job like this. Can we cover the roof with A double layer of snow and ice shield until spring? We're going to put a metal roofing material on that lean to. Thank you for any information you can provide. Have a great Holiday and a Happy New Year! I live in a double wide trailer and i am get water leaking on peak i was wondering if i could put ice and water down on peak and then seal over the whole roof with kool seal. It is just temporary. I plan on building new house in a few years. I am installing a raised paver patio that will extend beyond the top of my basement foundation and I am looking for a moisture/water barrier to use to protect the wood sheathing, Would this product work for this application? Hello Tim, I told my roofer about this product. He said to only install it around the bottom 3 feet of the roof. I told him I wanted it on all of the roof, he said that would create premature usage of the shingles because it traps more heat than regular paper or other synthetic membrane. He suggests to use Roof liner instead ( a synthetic membrane made by DuPont) which to me looks like plastic on the rest of the roof. Is he accurate about the premature usage of the shingles ? Excellent write-up. Thanks for taking the time to do this. The information has been very helpful and I think you did an excellent job of dealing with the naysayers and trolls. Thanks for taking your time to do this. can you apply this to porch decks as an underlayment for pavers? Hi trying to make my mind up doing a low slope roof 45x65 with ice shield . Does it have to be nail along the joints . Porch roof was leaking in many places due to failed flat roof system (lots of roofing cement) ripped it all up changed pitch from 1.5:12 to 3.5:12 (to match back section) covered entire roof with grace I&W some areas exposed for a week or two. All finished no more leaks. Stuff is sticky above 75 degrees just take your time and you should be fine. I had a new roof installed (tear off). My roof is 12/5 pitch.Walls are approx 10" thick. Code in VA says ice/water shield needs to be 24" beyond the inner wall. Regular wall areas require 60" minimum. Where I have a porch that will be 96" minimum. Roof contractor installed one 36" run on all edges and shingled over, other covered w/ 15 lb paper. How critical is it to have the ice shield to the code specifications? We are building a house with a flat roof because it is protected under a much larger metal building. The contractor is going to use this Ice and Water shield product. I notice in the comments and video it is being used for sloping roofs. What about a flat roof? What product needs to go over this to make it complete, etc. We live in an area where its common to have sideways hard rains to its possible that water could get splashed up under the canopy. Can you advise please? I am getting ready to replace my roof, single story 1,500 sq.ft, and there is a product that the roofing company is using they say is the same or better than Grace Ice and Water Shield called weather master polyseal SE. They claim it does the same things as Grace, are you familiar with this product? I'm not familiar with it. Why not just go with Grace and NEVER WORRY? I'm so tired of contractors making claims that something is just as good as something else. For goodness sakes, are they chemists? Do they moonlight at the plants in the R & D departments? Get the point? At the VERY LEAST contact the manufacture of the other product and make them PROVE to you it's as good as Grace. Hi my question is. When do you install Ice and Water Shield On tire roof do you still have to install underlayment? I have been seeing windows installed with a membrane similar to grace ice shield, behind windows. Can I use my left over ice shield for this cutting it into strips and applying as contractors recommend for water removal? Yes. No issues doing this at all. 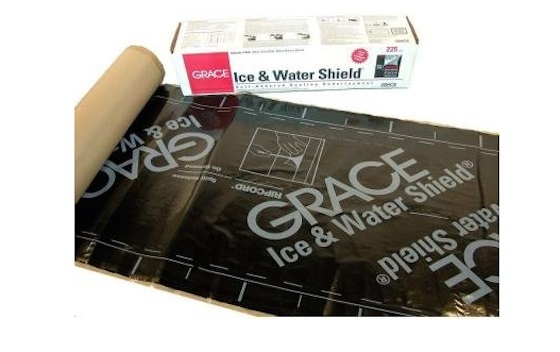 Can you apply/install Grace self adhesive ice & water shield (or something similar) on top of #30 tar paper as a secondary barrier? "I read the installation instructions for Grace Ice and Water Shield. It says to apply DIRECTLY to the wood roof sheathing. Would you apply it on top of 30# felt paper?" If you want a manufacturer to honor the warranty, then FOLLOW THE WRITTEN INSTRUCTIONS TO THE LETTER. I hate to say it, but you're the one who's wrong. If you're having condensation issues in your attics in MN, it's because you and your fellow contractors don't have a good understanding of how to ventilate. There are many white papers out there and science that demonstrates simple felt paper and asphalt shingles block moisture transfer through the *roofing* plane. Please do all a favor and stop commenting here and across the Internet when you don't have the real facts. I left your comment up as a teaching moment for homeowners to grasp that so much information on the Internet is not to be trusted because folks like you just don't know the physics of what's going on. When you read the product's Installation Manual what did it say? What did the manufacturer say when you called their 800 number? Thinking of putting snow and ice shield at bottom of window all the way to bottom of house in case any water gets behind tyvek. Since windows can be a problem area maybe this would be added layer of protection. Any problem with doing this? I've got no problem with this. Be sure the membrane laps over the foundation at least an inch. There is a gaping hole at the bottom edge with the ice guard material rolled or folded weird and the entire valley going up is buckled. I need the General Contractor to get this fixed. I am concerned about the place where the shingles do not lay flat and the ice guard is also not flat. What fix should I be demanding from the General Contractor? He keeps talking about my warranty but I want it fixed the right way now. Well, I'd just cut out the buckled material, install new membrane that's got no buckle and cover it with shingles the correct way. It appears to me to be straightforward. Will this product resist hail while uncovered? It's November and the roofer wants to install Ice & Water Shield for a couple of months until we decide on and order barrel roof tile. We live in Colorado where the hail can be fierce & the reason we are replacing our roof. You get hail in the winter in Colorado?? I don't feel anyone can give you the answer you seek. It depends on the size of the hail. I don't think you get hail in the winter, but maybe I'm wrong. I just wanted to say thanks for this website, explaining the use of the ice barrier a little bit more and providing some great advice. I'm in the process of planning a garage that I'd like to build all by myself and trying to learn as much as possible about all of the IRC specs, figuring out what type of materials to use, etc. It was interesting to see that based on the IRC that for steeper pitch roofs that you need even wider coverage of ice shield than you would on a lower pitched roof, that came as a surprise and I still don't quite understand why, but after reading through this, I think I'll consider covering the entire roof in the ice shield. Doing this entire project myself will save me an enormous amount of money and I'll use some of that savings to spend a little more on some things to do the best job that I can. I'll also keep in mind your call option to ask for advice should I have some specific construction questions along the way.